Within this area there are lots of fun activities - Opening Times and Prices are listed below too. Test your golfing skills on our 9 hole putting green. This activity is chargeable and an additional £1.00 refundable deposit applies - if a ball is lost or damaged then the deposit will not be refunded. Play mind boggling outdoor games including giant chess or draughts and giant connect 4. This equipment is free to use and cannot be privately booked or relocated. This is chargeable and available for half hour sessions. As with golf balls, there is a deposit for table tennis balls - should these be lost or damaged then the £1.00 deposit will not be refunded. The Snack Stop retails drinks, ice-creams, confectionery and snacks. The Carnfunnock adventure playground offers a range of challenging and exciting equipment for toddlers to 12 year olds, many of which are also suitable for children with special needs. For the under 5s, there is a dedicated play area with dolphin 'turfrider' spring rockers, saddle spinners, see-saw and swings; all alongside a 'toddlertown' multi- activity play unit and sensory play centre, both with fun interactive panels. Slightly older children have the choice of two magnificent custom built ships, one with a challenging giant 'spacenet' rope climber attached to a huge 5.5 metre mast in the style of a fishing net. Over 5s can also enjoy the centrepiece of the play area, an impressive tower lighthouse, with its three tunnel slides, standing tall to warn ships of the climbing rocks nearby. Other modern and adventurous play equipment includes a challenging 20 metre long zip-wire with 'sharks' below, a variety of swings including an aerial swing/surfboard and many other types of fun interactive equipment including talk tubes for children make new friends. 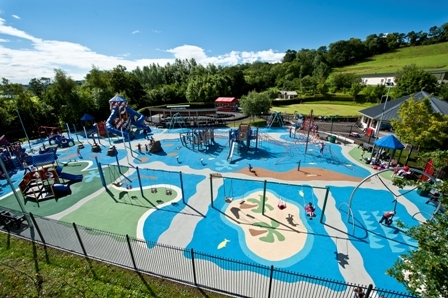 The playground is fully enclosed with a 'wetpour' rubber safety surfacing throughout and CCTV coverage to ensure a safe environment for adventurous play. All children must however be accompanied by a supervising adult. *All deposits refundable subject to safe return of equipment. **Identification required. No putters, balls or bats are allowed to leave the Activity Centre area.